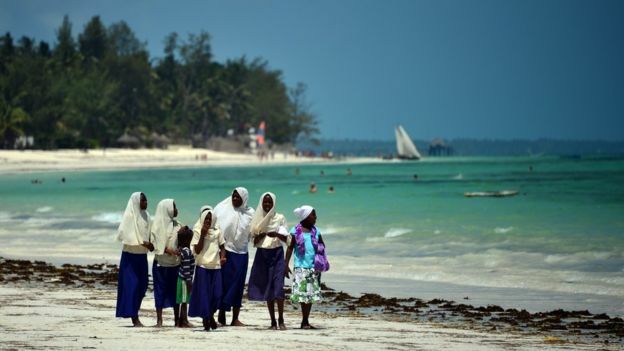 Five sites in the High Seas, which belong to no country, could be recognised under the World Heritage Convention, according to a new report by UNESCO’s World Heritage Centre and International Union for Conservation of Nature (IUCN), the advisory body on natural World Heritage. The report has been launched from a submersible at the edge of one of the most iconic of these sites – the Sargasso Sea. 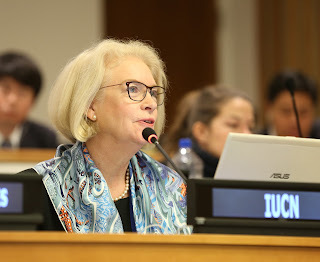 “Just as on land, the deepest and most remote ocean harbours globally unique places that deserve recognition, just as we have given to the Grand Canyon National Park in the United States of America, to the Galápagos Islands in Ecuador or the Serengeti National Park of the United Republic of Tanzania,” states Mechtild Rössler, Director of UNESCO’s World Heritage Centre, in the preface to the report. 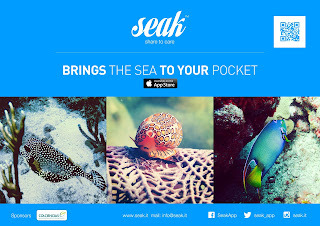 empowers anyone to discover marine life, no matter where the user may be located, through other user’s eyes, connecting them with nature and generating a sense of belonging and protection for our seas. 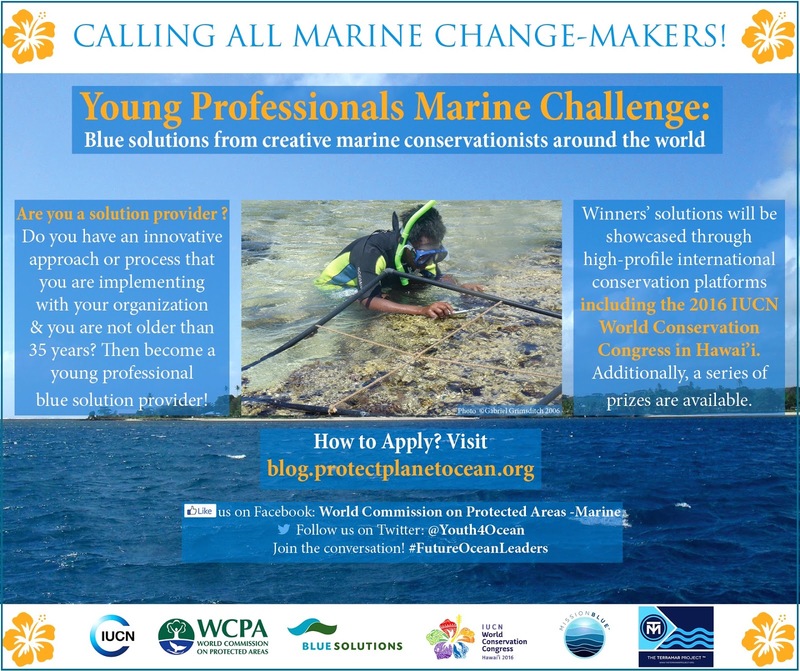 The International Union for Conservation of Nature (IUCN) World Commission on Protected Areas (WCPA) Marine Young Professionals Task Force have partnered with the Blue Solutions project, Mission Blue, #OceanOptimism and TerraMar on a new initiative to highlight and promote the projects of young people working for marine conservation around the world. The competition partners invite youth and young professionals actively working on innovative and creative marine conservation initiatives from around the world to take part in this competition. Are you a young blue solution provider? 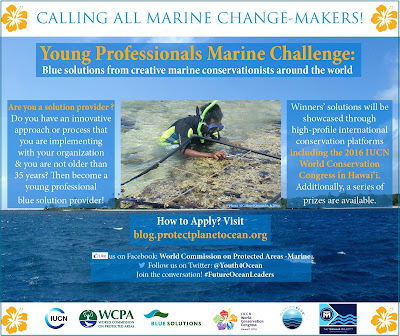 Do you have an innovative and creative approach or process that successfully address marine conservation issues that you are implementing with your own organization and you are not older than 35 years? Then become a young professional blue solution provider by submitting this form by 31st May. In response to mounting concerns about declines in ocean health, States at the United Nations (UN) delivered some good news last week. The first of four two-week UN Preparatory Committee sessions concluded on a positive note on Friday April 8, 2016 by identifying key elements for a new treaty to better protect and sustain the marine environment and marine life in the two thirds of the ocean beyond national boundaries and adopted a roadmap for the path ahead. The next session will be convened from 26 August to 9 September 2016. (F) Open Choice: Photos that would not fit in the above categories. E.g. macro, artistic images, etc. The dates for the “Regional Forum on Solutions for Oceans, Coasts and Human Wellbeing in Africa” have now been confirmed to take place on 31 May – 3 June 2016 in the SeaCliff, Zanzibar, Tanzania and you can now express your interest in participating in this event. The oceans are mankind’s lifeline, which contribute to over 70% of the oxygen we breathe and over 96% of our water supply. The oceans are so vast that they cover 72% of the world’s surface. 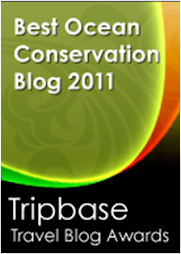 With our oceans being at the brink of disaster, we have to do something to stop our vital system from destruction. In 2007, over 2.12 billion tons of plastic had been dumped into our oceans. In 2014, 5000 square miles of the Gulf of Mexico was almost devoid of any life, all because of pollution. Our modern industrial lifestyles are affecting our oceans in the worst ways possible and this could lead to the most detrimental of consequences.